Aside from C Code 399, recent changes to verification have been pretty benign. Until now. Amy Glynn breaks down what that means for your Financial Aid Office—and where to get more info. VP Amy Glynn was published in the “Student Aid Perspectives” section of the NASFAA newsletter. In it, she points to research showing that loan letters are helping to curb borrowing. StudentForms custom appeal functionality allows students to complete the BOG Fee Waiver appeal process via self-service. And schools can review and approve/deny the appeals digitally. 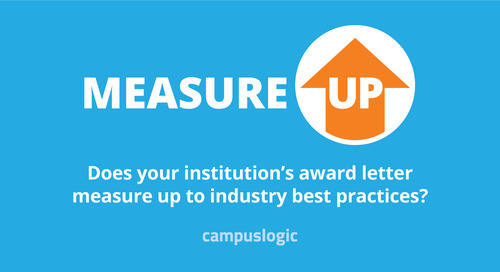 As Senate hearings on the HEA reauthorization continue, CampusLogic VP Amy Glynn sees an opportunity to fix a broken system. She explains how in a recent letter to senators Alexander and Murray. Did your school upload an NPC for compliance—and then simply forget it? Or, are you using it as the powerful recruitment tool it should be? Learn how in this NPC best practices series. Students and financial aid offices are in crunch time—making the recent downtime of the IRS Data Retrieval Tool problematic. VP Amy Glynn weighs in on potential repercussions across the industry. Maryland bills HB509 and HB262 would require higher education institutions receiving state funding to send certain annual notices to students about their education loans. VP Amy Glynn weighs in. Increased potential for conflicting information to appear due to early FAFSA and prior-prior year has given rise to C Code 399. With it come implications for both students and staff. Ah, compliance. The critical part of student financial aid for schools that is also occasionally (frequently) the bane of financial aid admins’ existence. Here's 4 ways to boost compliance.